THE four Camden post offices earmarked for closure have less than a week left in business before they close their doors forever – and attempts by customers to stop the cull have stalled at the critical moment. A legal bid mounted by a Belsize Park community group to stop the closure of the Englands Lane post office has hit problems after Jonathan Cohen, a pharmacist who houses the post office inside his chemist, told campaigners the branch would be shutting for good on Tuesday. Helen Lambert, of the Primrose Gardens Community Association, who collected more than 1,000 signatures from those who wanted the post office to stay open, said Mr Cohen’s decision not to back their calls for a judicial review was “extremely disappointing”. She was due to deliver a cheque for £3,000 to solicitors tomorrow (Friday) in a bid to get an interim injunction to halt the closure when she learned Mr Cohen had decided not to back the campaign. Mr Cohen and the three other sub-post masters running branches in South End Green, Highgate Village and Somers Town, will receive compensation for closing their businesses. 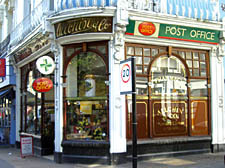 The settlements given to postmasters vary, but the Post Office has confirmed it averages out to be around 28 months’ wages and depends on the levels of service they provide. The Primrose Gardens Community Association, who put together papers seeking a High Court ruling over the closure of the Englands Lane branch on the grounds it would hit the elderly and disabled, are now resurrecting dormant plans to open a branch in Haverstock Hill. Newsagents Action Mate, run by shopkeeper Minesh Patel, was earmarked for a possible post office two years ago but talks broke down. Meanwhile, there has been no movement on a white charger rescue bid by Camden Council to take over the four branches. When the closures were announced, the Town Hall said it could step in and run the branch. But with just five days to go, nothing has been agreed. A council spokesman blamed the Post Office for delays providing financial information needed before it could put together a rescue package. The spokesman added: “Post Office Limited have finally released financial information to us after we signed a non-disclosure agreement.